Left Needs to Check Their Priorities:Kellyanne Conway on her knees in Oval Office vs. Elderly vet laying on the floor of a VA hospital. The left is mad that Kellyanne had her feet on the couch in the Oval Office… I cannot believe this is even a topic of discussion. Hmm, I find that interesting, no one seemed to mind when Monica was on her knees underneath the damn desk. But now suddenly Kellyanne Conway is the Devil, right, OK. Kellyanne was seen taking a photo of the President and various leaders of historically black universities and colleges in the Oval Office (HBCU). Does the left have nothing else to complain about?? That must mean President Trump has stayed off Twitter. There are various pictures floating around, all of Kellyanne trying to take a group picture, which by the way, has to have at least 45 people in it. Let’s break this down: Kellyanne is like five feet tall and weighs like 120 pounds… How in the world is she supposed to be able to take a picture of a group that size, when she is tiny like that?? There’s one picture of Kellyanne on her knees on the couch checking the picture she just took, then there is one of her almost kneeling/standing on the couch trying to take the photo from a higher angle. 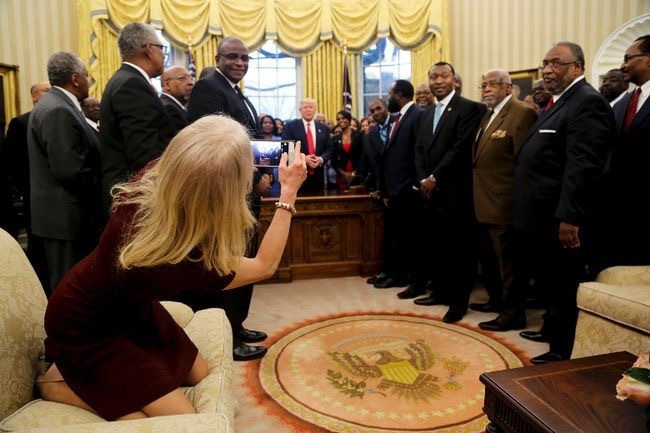 Twitter losers are trying to say that by Kellyanne sitting with her feet on the couch, that that is somehow so incredibly unprofessional and disrespectful to the leaders of HBCU… If she really wanted to be disrespectful couldn’t she have just not taken the picture? How is trying to get a better angle for a picture “disrespectful”, you people need to get over yourselves. What is “disrespectful” is having an intern on her knees while on the phone with foreign leaders… Let’s not even talk about how “professional” that one is. Can we get back to reality? Why is nobody talking about the elderly veteran that was lying on a North Carolina, VA hospital floor in pain… Are you kidding me? There were two older men who were in pain, and after being ignored by staff for hours, one laid himself on the floor after being told there was no place for him to rest. Another vet looked like he was going to fall out of his wheelchair, and the Left wants to talk about a damn picture? 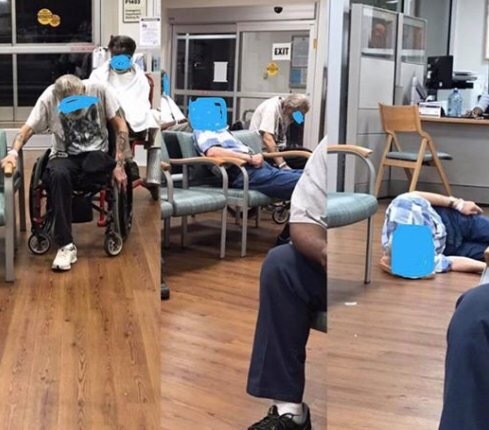 This story broke because a couple who were also waiting at this sad excuse for a hospital, were troubled by the scene so they took to Facebook to share their concerns, rightfully so. This is simply unacceptable and inexcusable. Liberals care so much about protecting illegal immigrants, refugees, and allowing boys in women’s bathrooms, but no one blinks twice about men and women who served and fought for their country, it’s sickening, really. Our veterans are on the streets with nothing, and the Left wants to bring everyone into the country… but won’t think about finding homes for people who actually DID SOMETHING for America. Our vets deserve better. So instead of Democrats telling Republicans to “check our privilege”, why don’t they get some perspective and check their priorities. I’d like to thank all of our service men and women, past and present, who fight for our right to be free.